Israeli soldiers injured, Friday, dozens of nonviolent protesters during the weekly procession against the Annexation Wall and Colonies in Ni’lin village, west of the central West Bank city of Ramallah. The protesters marched from the center of the village heading towards their orchards, isolated behind the illegal wall, while chanting for liberation and ending the Israeli occupation, its ongoing violations, and colonialist policies. The soldiers instantly fired a barrage of gas bombs at the protesters, causing dozens to suffer the effects of teargas inhalation, before local medics provided them with the needed treatment. 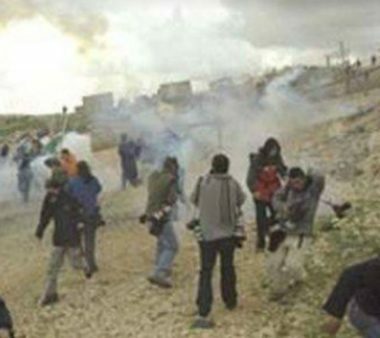 The soldiers also chased many protesters in the Palestinian olive orchards but could not abduct any of them. The procession was held by dozens of locals, accompanied by Israeli and international peace activists.